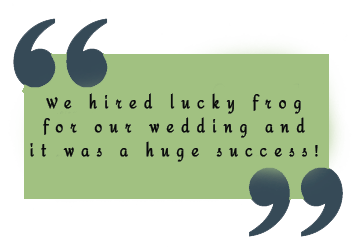 Why hire Lucky Frog Photo Booth? We provide a high quality photo booth experience to LA and Orange County, using the latest technology. We have put countless hours into perfecting our touch screen system, so it will be an enjoyable experience for all of your guests. We strive to achieve high satisfaction, and provide the best possible photo booth experience. We have several years of experience in the multimedia field. 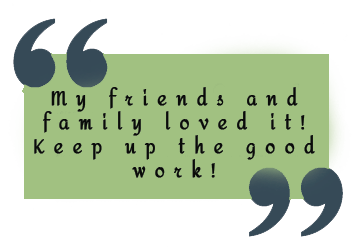 We service all of Los Angeles and Orange County area. 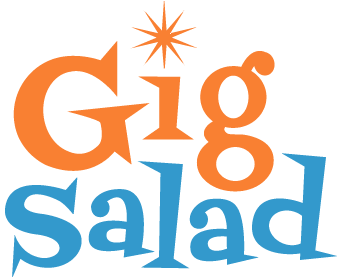 We do Birthdays, Weddings, Graduations, Engagements, Christmas Parties, Corporate Events, Charity Events, Sweet 16's, All Holiday Parties, Quinceneras, Going Away Parties, Family and School Reunions, School Dances, YOU name it, and WE’LL bring you FUN! We are an established business with 7 years of experience and liability insurance. We are experienced event professionals, with many years in the multi-media field. Customer service is our #1 priority. This means you will get quick responses from emails, your template will be customized to your liking, we will be at your event on-time and ready to go, and your photos will be uploaded to a web gallery quickly after the event. We offer many customization options to make sure you get exactly the booth you want. We know photography and proper lighting, so your photos will turn out beautiful each and every time.We offer quality prints using a dye sublimation photo printer, taking only 10 seconds to print. We have lots of sturdy sanitized props, and can provide a prop table if needed. 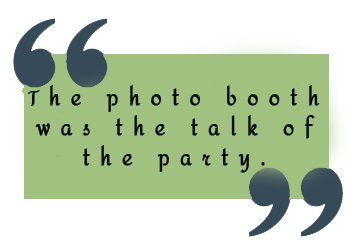 We strive to always get better at photography, and offer a better photo booth experience at a very reasonable price.